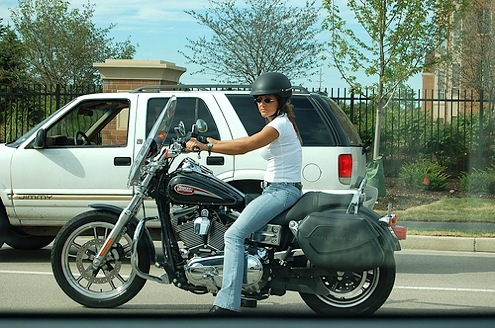 Why Do Women Ride Motorcycles? The question I most get asked, especially by my dad, is why would I want to risk my life getting on a motorcycle? It doesn't make sense to my dad why anyone would do that. It apparently made more sense to him when my brother got a bike that it did when I got one, but still, he was legitimately baffled by the whole idea. What do women get from riding that they can't get anywhere else? I have a few ideas. Women today have fewer expectations placed on them when it comes to hearth and home. It is no longer a woman's primary function to keep the house and raise the kids. Women are expected to be out in the world, earning a living, as well as giving birth, raising kids, making sure there is dinner for everyone, and doing the laundry (just to name a few of the expectations!). While we may have shed the shackles of home and hearth, we certainly took on our share of the rest of the responsibilities, and then some. So here's what getting on a bike can give you that nearly nothing else in the world can give you - a sense of freedom. It may be as short lived as a trip to the bank, but the feeling of freedom you get when you get on a bike and ride is nearly indescribable. It must be like climbing a mountain or bungee jumping. I can't compare, as I haven't tried those things. But climbing on a bike is exhilarating. It's a rush like nothing else. And you don't have to climb a mountain to get that feeling. You just have to get on the bike. It takes a lot of confidence for a woman to get on a motorcycle and ride. They're big and powerful machines and women have long been taught that big powerful things are for men only. For a woman to take on something like a motorcycle, she must have a great deal of confidence in her own abilities. She needs to handle the bike and she needs to be knowledgeable about the bike. She needs to be able to function independently around the bike. If a woman has confidence, she can do this. But here's the thing. If a woman doesn't have the confidence to just jump on a bike, she can learn that confidence by learning how to ride. Many women are hesitant to ride if they haven't done it before. Some women take classes to learn the basics and by the end of the class, feel confident they can handle themselves. Other women rely on friends to help them learn. But overall, women ride motorcycles because it makes them feel free and confident about themselves. Women often begin to ride because someone they know is riding and they want to try it out. Sometimes women will have an urge to ride and will seek out a women's riding club to join so they won't have to ride alone. But motorcycle riding does for some women what book clubs do. It gives them a shared experience and it allows them to have a common bond with a group of women they can then come to call friends. Motorcycle riding builds friendships in ways nothing else can. Women who share a sense of adventure and a freedom of spirit can bond over motorcycle riding. Women come to motorcycle riding for many different reasons. At the end, it doesn't really matter why you want to ride. It just matters that you do ride. Ride often, make good friends, and feel free. That's what makes riding special.